© 2019 Stonebridge, All rights reserved. Hoffman Town Center Blocks 4 & 5 is a landmark mixed-use development, uniquely positioned to transform the Carlyle and Eisenhower area of Alexandria into a hub of live-work-play. The 930,000 square foot complex will allow up to 720,000 square feet of residential uses, in addition to over 210,000 square feet of retail anchored by an 84,000 square foot Wegmans, the region’s premier grocer. Approximately 700 residential units will reside in three separate towers, infilled with a three-acre amenity park situated over a five (5) story podium. Outdoor amenities will include pet parks, gardens, a pool with wading area, fountains, a theater and fireside lounges. Units will range from studios to three bedroom apartments. Interior amenities will include fitness centers, a pet spa, a wine and coffee bar, a demonstration kitchen, club rooms and business centers. Hoffman Town Center is strategically located, sitting one block from the Eisenhower Avenue Metro Station and immediately off the Capital Beltway, with direct access from the I-495/95 ramp. The complex also finds itself within walking distance of two of Alexandria’s largest employers, the new National Science Foundation Headquarters and the U.S. Patent and Trademark Office. Stonebridge has fully entitled and capitalized the $400 million project. 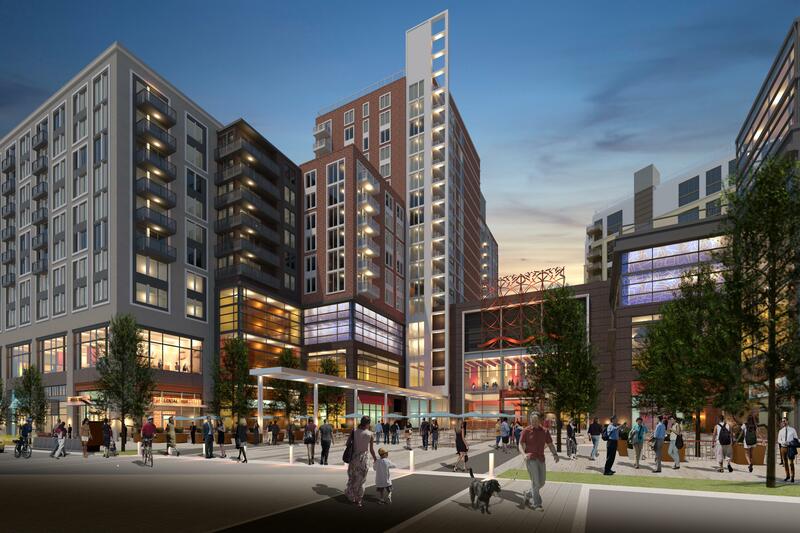 Construction of Hoffman Town Center will start in the Summer of 2019, with the project opening in Fall of 2021 and delivery of the final component the Spring of 2022.